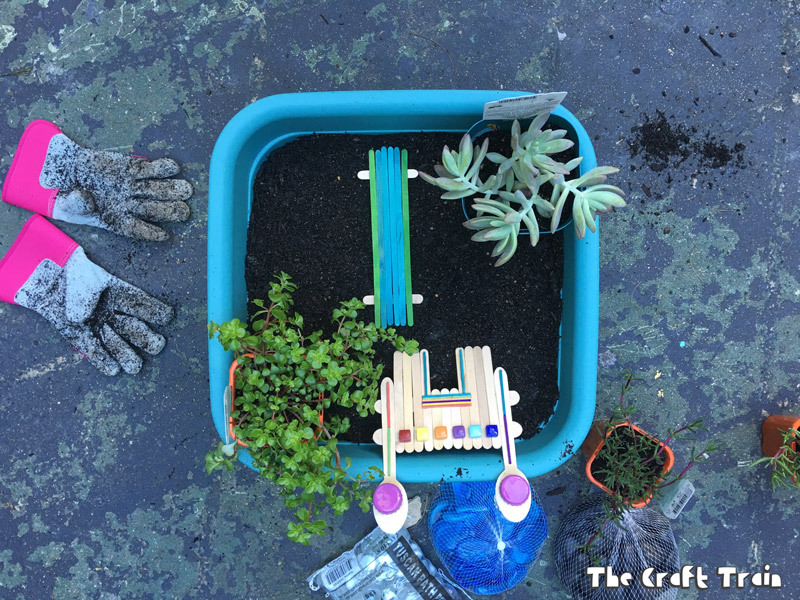 Each year in the Spring I like to get the kids doing a bit of gardening and I always think it’s nice for them to have their own special garden to look after. Last year we planted pots of mixed flowers like pansies, snap dragons and marigolds. Our courtyard gets full sun in Summer so they need to be watered every day to survive and lets just say they weren’t watered every day. It was a good learning experience for the kids but really a waste of money for me. 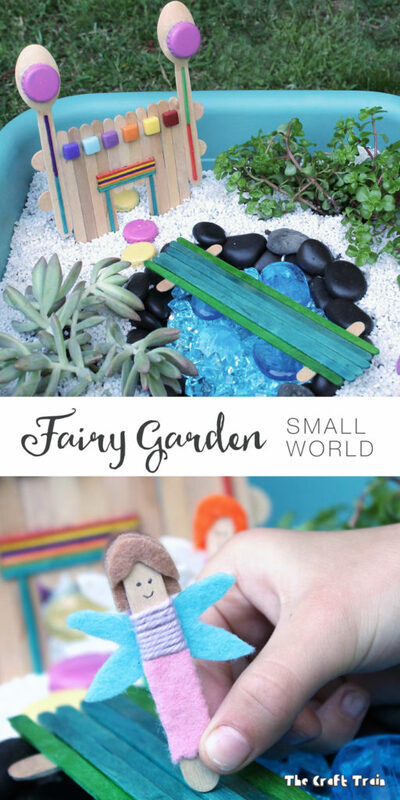 This year we decided to create fairy gardens as a part of our Easy Fairy Crafts for Kids series and also as a (hopefully) lower maintenance garden for them. 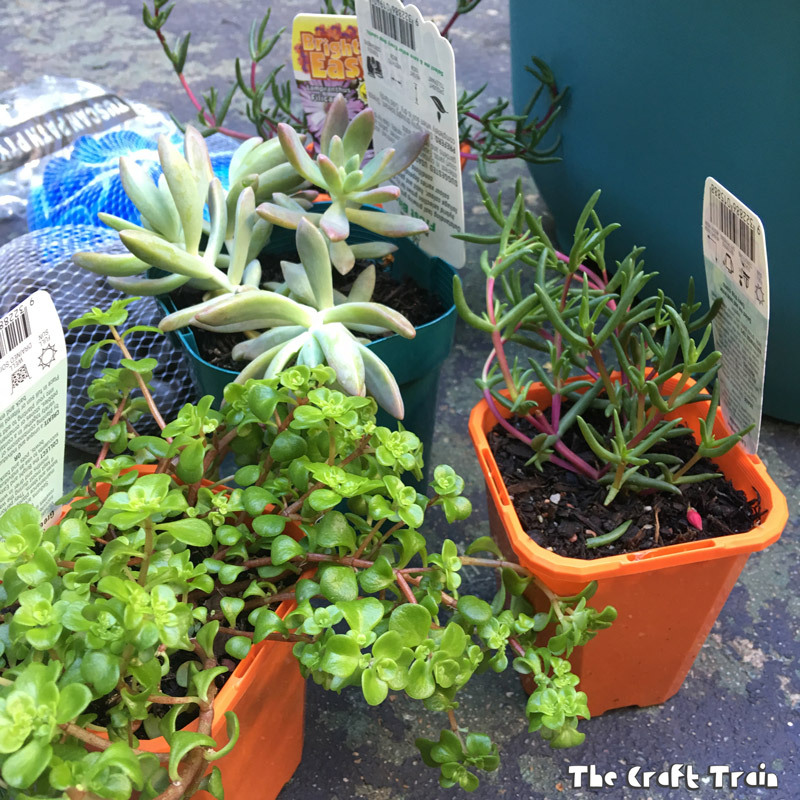 We’ve used succulents as the plants because if you forget to water them for a week or two in the middle of summer they’ll still be alive at the end of it, and we also splurged on the fancy self-watering pots to plant them in because even succulents get thirsty sometimes. 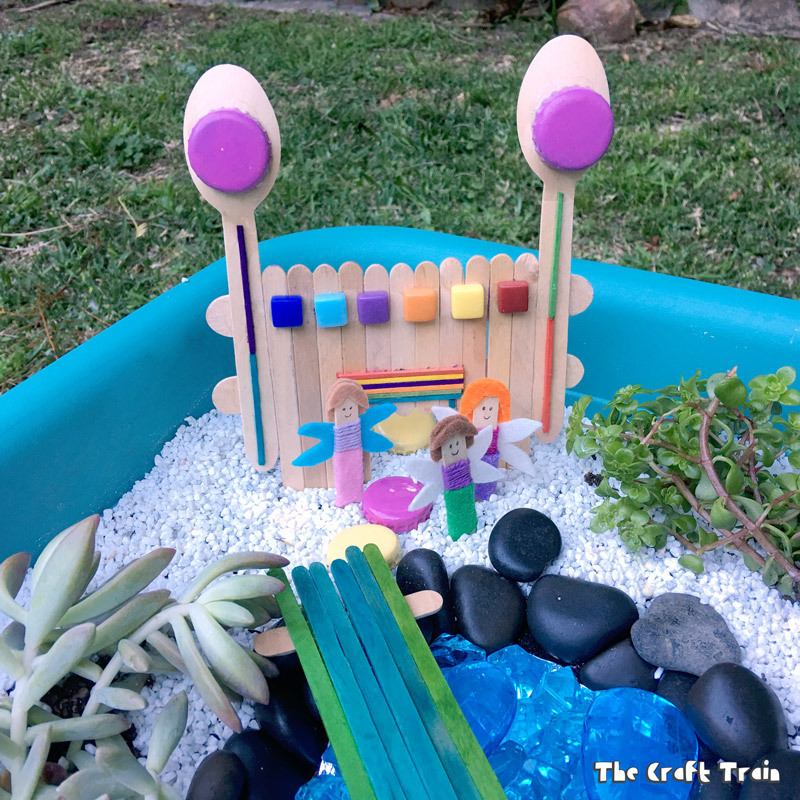 There are lots of amazing fairy gardens to be inspired by online but the one which inspired us most was this lovely fairy garden by Laughing Kids Learn. 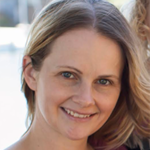 I love the beautiful ornaments Kate has purchased to decorate her potted garden. 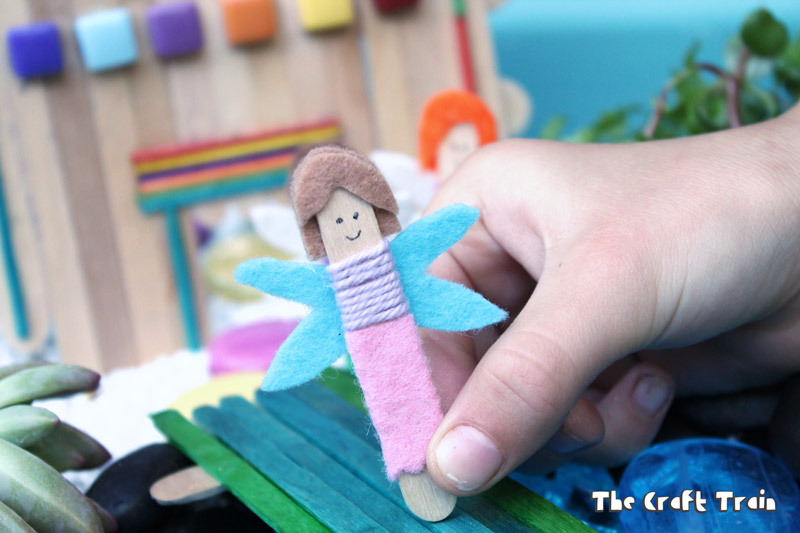 Our fairy accessories are made from craft sticks, visit part one of our Fairy Crafts series to see how we made them (it’s very easy!). Fill your pot with soil and then roughly lay out where you want your plants and decorations to go. 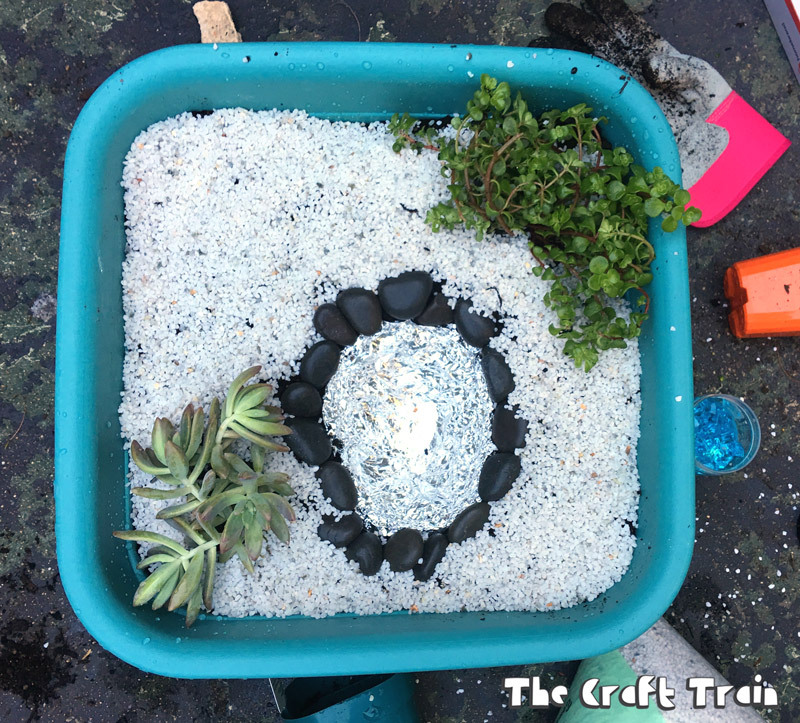 Plant the succulents and then dig a small hole and line with alfoil to make the glass gem pond. 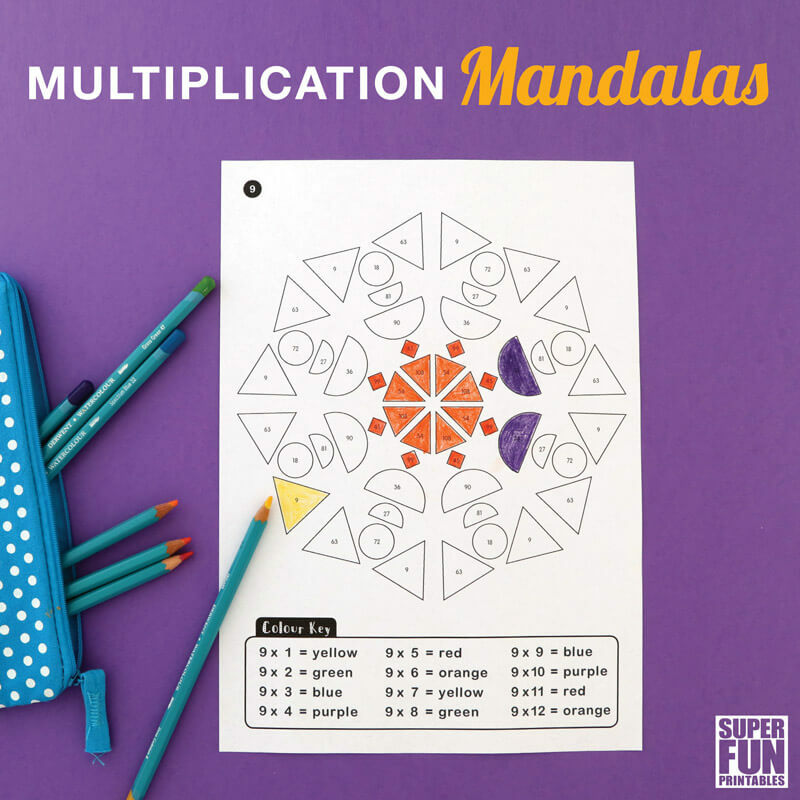 The foil will give your blue gems a bit more sparkle. Poke a few holes in the foil to create drainage for the pool so that it won’t fill up with water in the rain. You can see I surrounded my pool with black pebbles and then put a layer of small white bonsai pebbles over the whole garden. Feel free to be as creative as you like though. 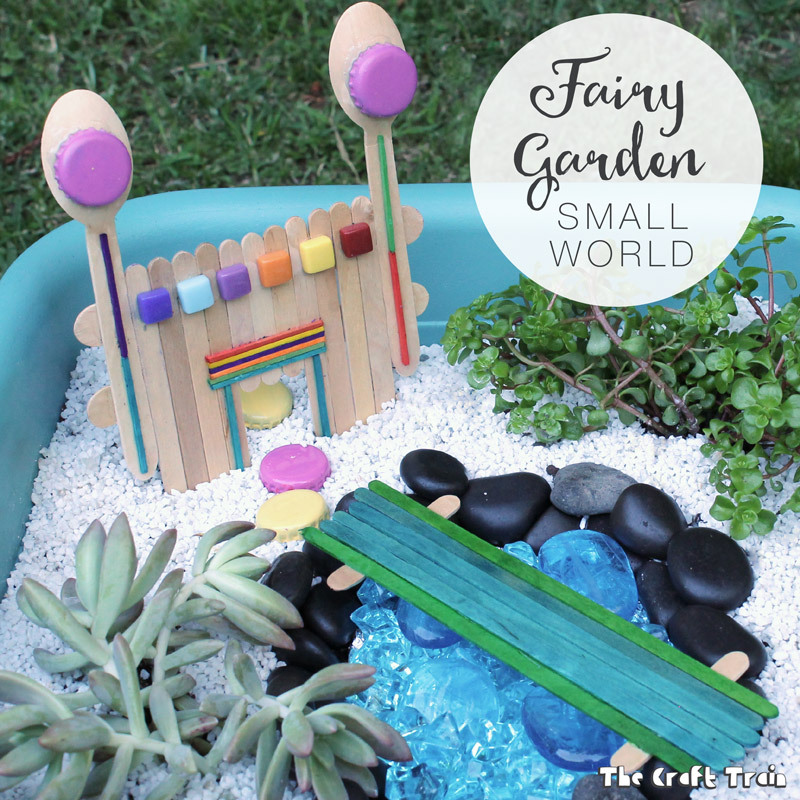 Fill the pool with blue glass gems and add your craft stick fairy castle and bridge. Now it’s all ready for the fairies to move in! 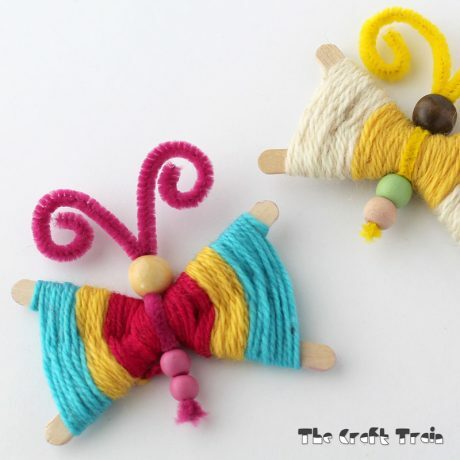 Our fairies are made of felt, yarn and craft sticks so they may not last forever in the outdoor weather but we’ll see how they go. 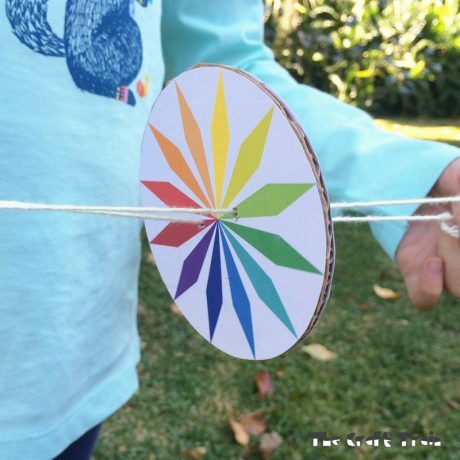 Of course the craft stick fairies are only for decoration because, as miss K says, there are already real fairies who can live in our gardens. 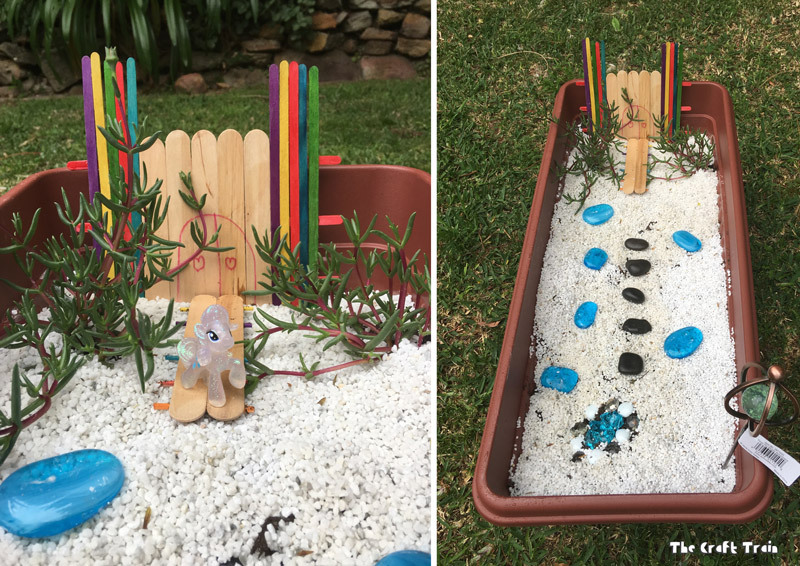 Above is Miss R’s unicorn garden and below Miss K’s fairy garden. 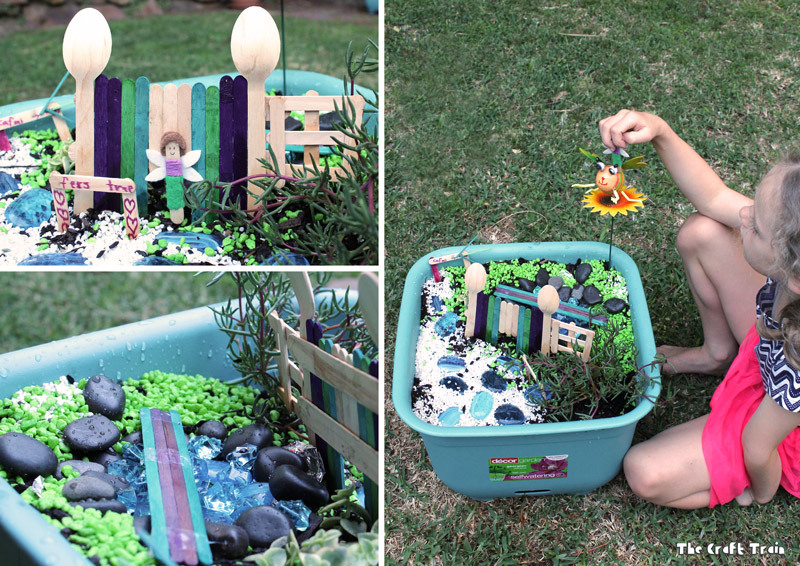 For the girls making their own fairy garden was a fun and creative project. 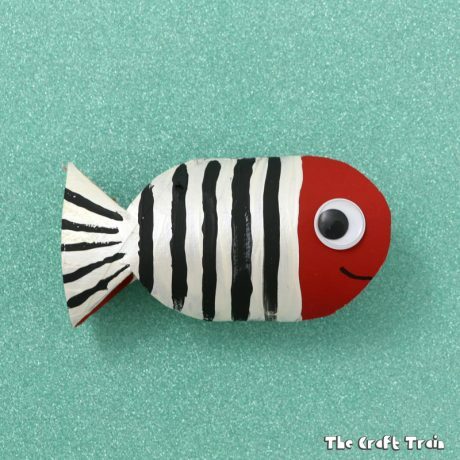 They are happy with their creations and like to use them in games of imaginative play. 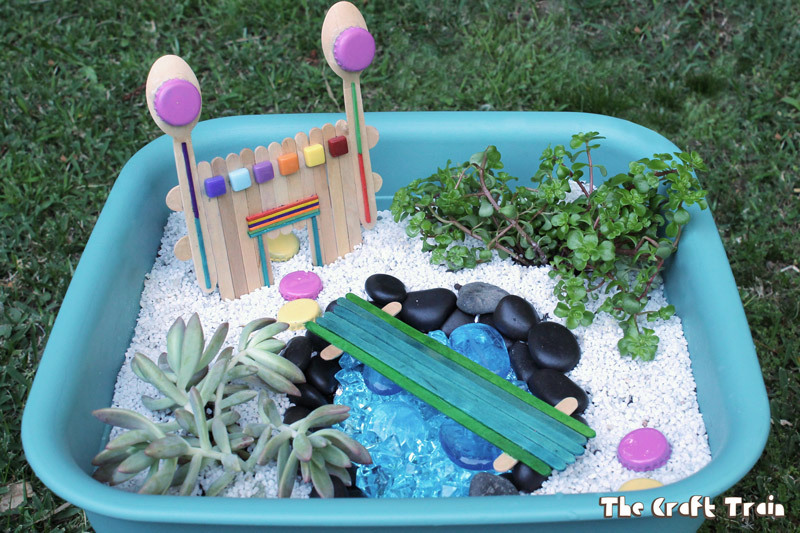 We hope you’re feeling inspired to plant your own fairy garden at home. 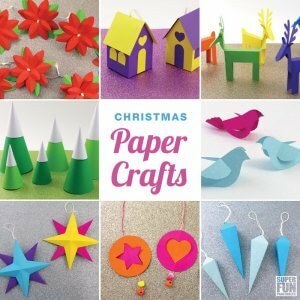 Don’t miss part 3 in our Easy Fairy Crafts for Kids series to be posted next week (spoiler – it might be some printable fairy stationary). 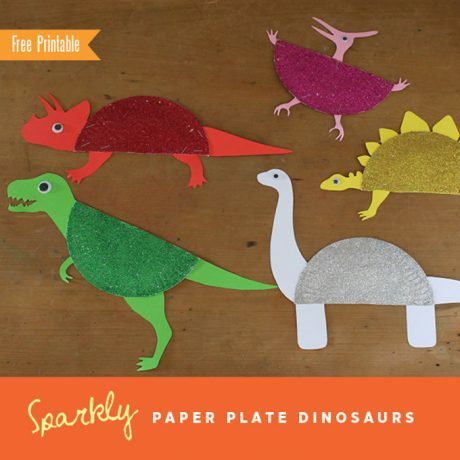 We also have a specially dedicated fairies board on Pinterest. 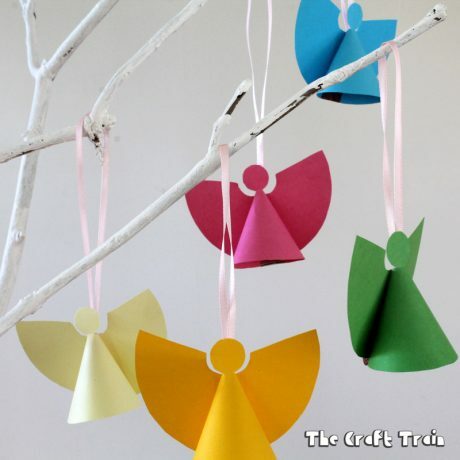 It has lots more lovely fairy crafts to inspire you to get creative at home.